, as well as templates designed by experts and developed specifically for your organization. Today, we’re making it easier for users to create files from templates by granting access to templates directly from Drive. 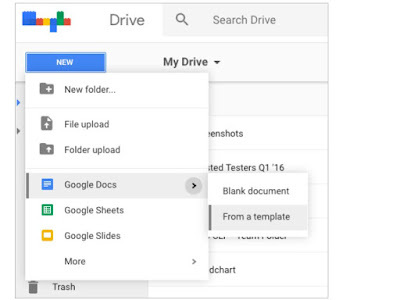 Instead of navigating to the Docs, Sheets, Slides, or Forms home pages, you can simply go to Drive > New > Google Docs/Sheets/Slides/Forms > From a template. From there, you’ll be directed to the applicable template gallery, where you can select the template of your choice. For more details on templates, visit the Help Center. Since 2015, we’ve been making it easier to focus on your content—not your formatting—with templates in Google Docs, Sheets, Slides, and Forms. We’ve introduced templates for invoices, pitch decks, and cases studies, as well as templates designed by experts and developed specifically for your organization.